Many people are switching to whole wheat flour and other whole grains because whole grains are far more nutritious than white flour. 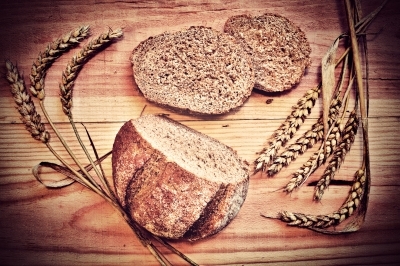 Whole grains are rich in fiber and health-promoting antioxidants, and research has shown that those who eat them regularly weigh less, on average. Baking with whole wheat can be challenging because it changes the texture of baked goods, and some people don’t like the way whole wheat flour tastes. If you dislike whole wheat, you could give spelt flour a try. The flavour is milder and a little closer to white flour than whole wheat. If you don’t like spelt, there are plenty of other whole grains, including amaranth, barley, buckwheat, bulgur, corn, KAMUT ®, millet, oats, quinoa, rice, rye, sorghum, teff, and triticale. Texture tends to be an issue when substituting whole grains for white flour. Breads, in particular, can end up dense, dry, and bricklike. But there are a number of things that you can do to make your whole grain breads lighter, fluffier, and moister. 1. When substituting whole wheat flour for white flour, add more water for a moister finished bread. Whole wheat flour retains the nutritious germ and bran that are lost to processing with white flour, and they absorb more liquid. 2. For a nicer texture, add a tablespoon of wheat gluten for every two cups of flour, or buy whole wheat flour with added gluten. Flours that are formulated for bread machines usually have added gluten, and gluten is also available online and at health stores. 3. You can improve the fluffiness and softness of whole wheat bread by adding an acidic ingredient such as buttermilk, yogurt, or lemon juice to aid rising. 4. Whole wheat bread will be softer if you add honey (1-2 tablespoons), potato flakes (1/4 cup), or milk (use powdered milk or replace some of the water in the recipe with milk). 5. Softness can also be increased by allowing the dough to rest for 20 minutes before beginning the kneading process so that the wheat has sufficient time to absorb the liquid ingredients. For more information on whole grains, visit the Whole Grains and Health page. For more food articles and recipes, visit the main Food page. “Baking Bread with Whole Wheat Flour.” (2014). ABreaducation. “How to Make Softer, Fluffier Homemade Bread.” (2012). TheKitchn. Slavin, J. (2004). “Whole Grains and Human Health.” Nutrition Research Reviews, 17 (Available online as a PDF).